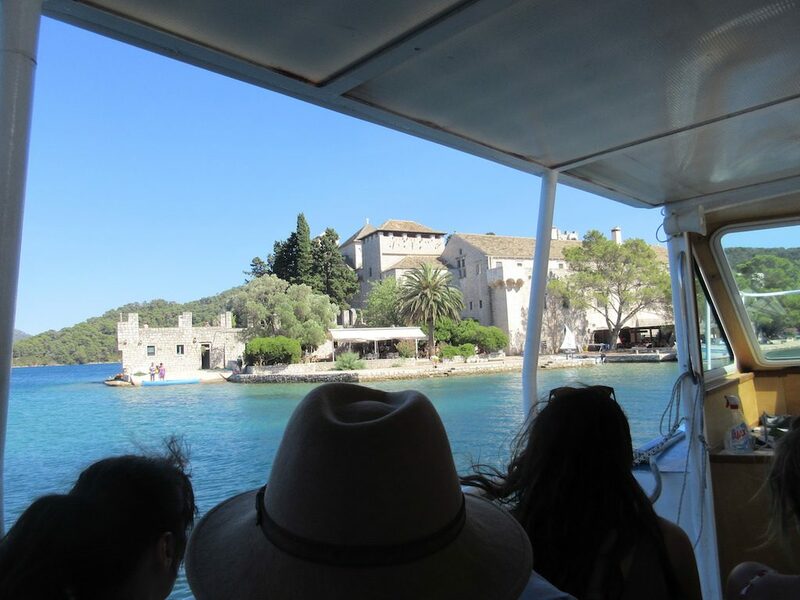 We departed Korcula at 6:30am bound for the small island of Mljet. Miljet has a population of only 1,100 residents and is about 23 miles long by 2 miles wide. About 85% of the island is covered with forests, the remainder of the island consists of vineyards, fields and small villages. Our boat was stopped in a cove not far from the island of Mljet and folks were swimming and kayaking awaiting an open space at the dock in Mljet in the early afternoon. About 10:30am Kent was returning our computer to the cabin and fell down the staircase leading to our cabin on the lower deck of the boat and broke his left arm. It was really floppy. 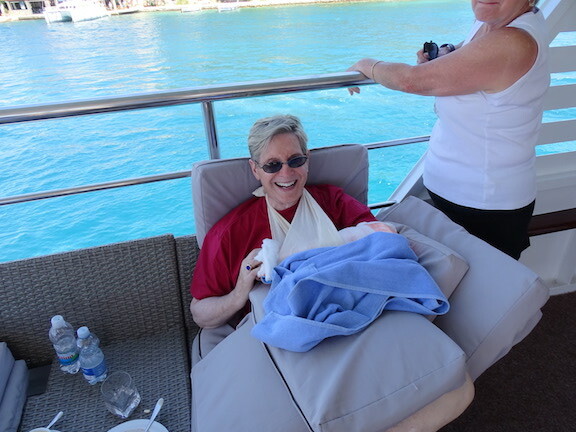 Luckily there was an emergency room doctor traveling with us who prepared a splint on Kent’s left arm so that we could transport him to a clinic on the small island of Mljet. 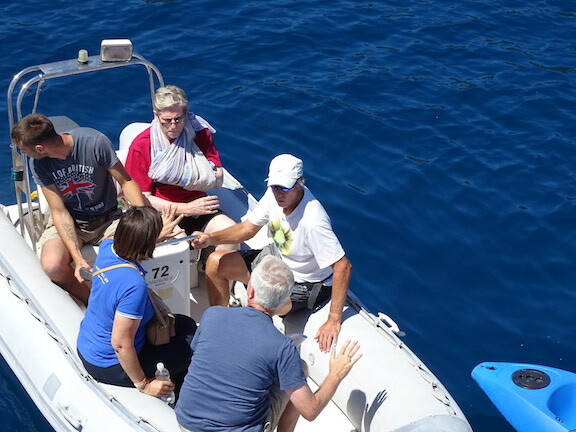 Once the splint was in place Kent and I were loaded into a small rubber boat with a motor for the short trip to Mljet. The ER doctor, Terry, and the cruise director, Debbie, accompanied us in the event of any language issues. Yuri, one of the crew members drove the boat….it takes a village! Once on landed we waited a short while for a cab to transport us to the local clinic. The island’s doctor informed us that they do not have any X-ray machine and no materials to create a proper splint for Kent’s arm. We will have to transport him to a larger town for further care. Terry and the clinic nurse on staff prepared the best splint possible with the available materials. Terry found some basic pain killers were available although he said that they were about 1/3 the strength of those provided in the US. Once his arm was stabilized, we took the taxi back to port, the rubber boat back to our main boat to make plans to get Kent to a larger town. There was a speed boat available to take us to Dubrovnik at 5:00pm that afternoon but the ride would take two hours and would be a very bumpy ride and not necessarily the best mode of transport. It was decided that our boat would take us to a port near Dubrovnik the next morning where we could get a taxi into Dubrovnik to a private medical clinic. After lunch we arrived in port on the island of Mljet and it was decided that we would move Kent to a hotel on shore near the boat dock. While Kent rested, I took a short trip into the national park. 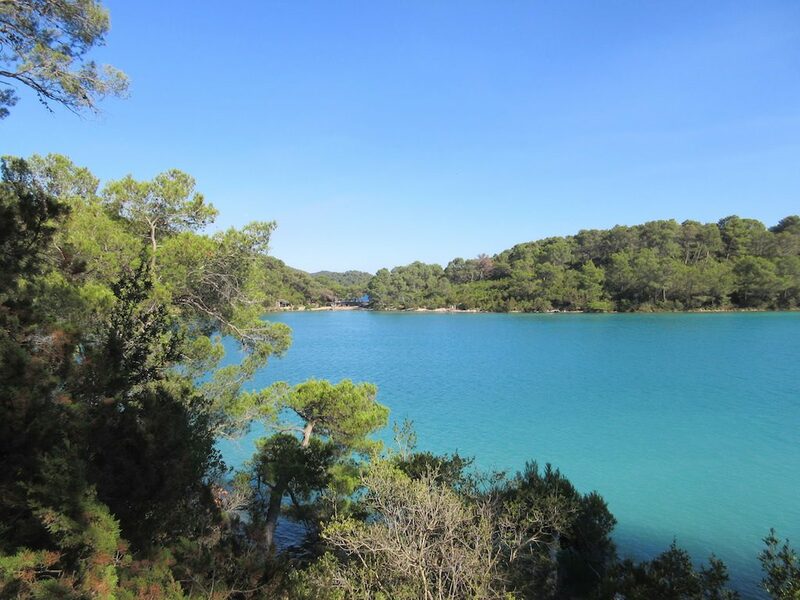 The park is mostly pine trees and there are several lakes and tons of walking and hiking trails. The park was busy with tourists who arrive by ferry to explore the park. 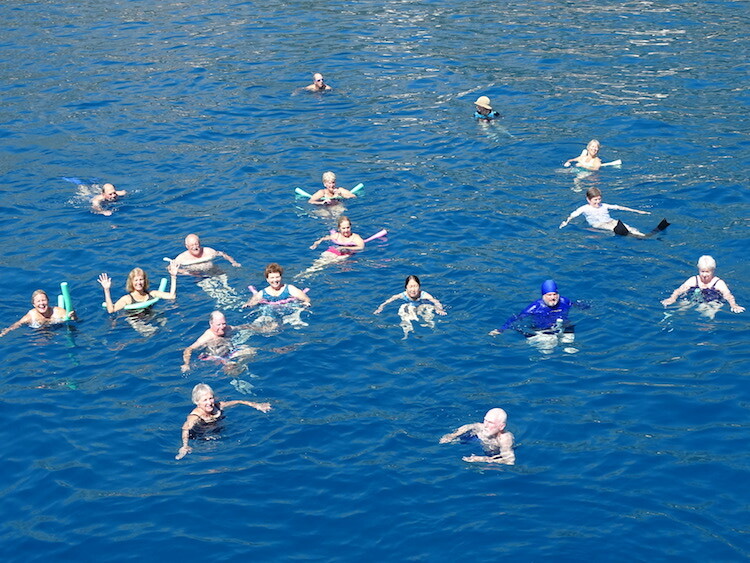 Many folks were swimming in the lakes, having pic-nicks and exploring the park on foot. One of the lakes has a ferry boat that takes you on a 20-minute ride to an island where I explored an old monastery that is now a part of the national park. 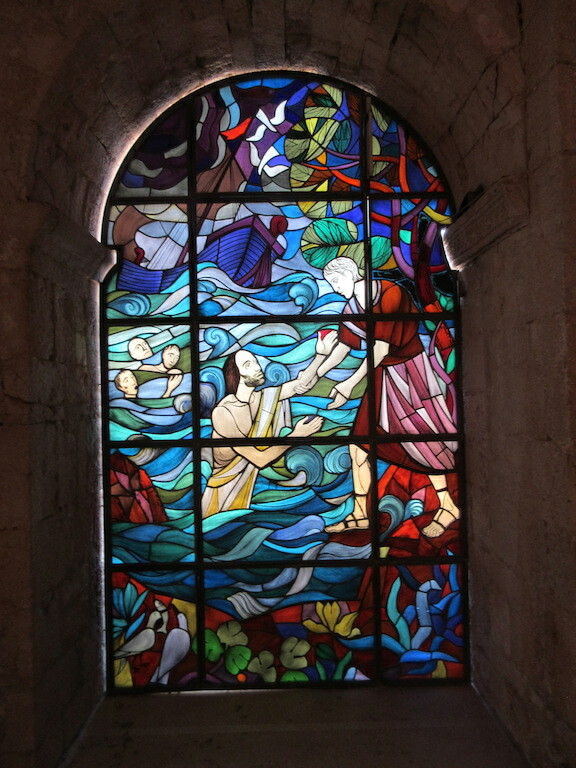 The building is being renovated but has a very nice central courtyard garden, a chapel with stained glass windows and a restaurant. It was a quick visit but I was happy to have a chance to see it. Kent was not in much pain, but more frustrated that he had ruined our vacation and was not able to participate in the activities. This entry was posted in Croatia 2017 by markcujak. Bookmark the permalink.